Continuing our IDF 2013 keynote coverage, Intel is also using this morning’s keynote to announce progress updates on previously announced 14nm products. Intel’s plans here remain unchanged, with Intel seeing the exploitation of their fabrication advantages being one of the keys to better capturing the various mobile market segments, so Intel’s progress on their 14nm process and the resulting parts remains as something worth keeping an eye on. 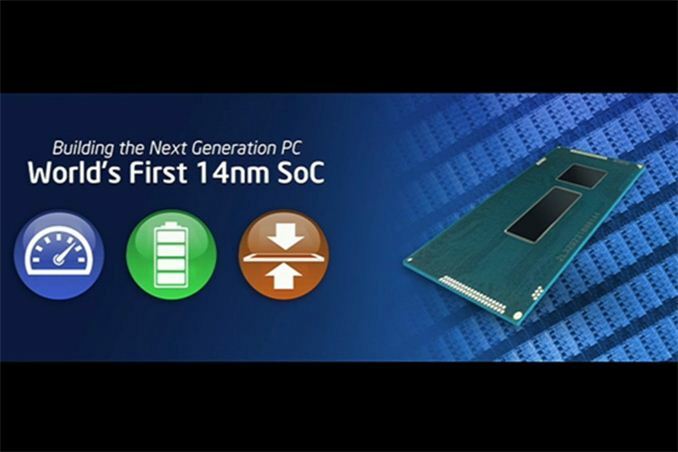 First and foremost with Broadwell, Intel has confirmed that they are beginning 14nm production by the end of this year, with Broadwell being the lead product for the process. We expect to get some additional details on Broadwell later this week in other sessions, but Intel did make quick note of the fact that they’re seeing significant power savings with 14nm Broadwell over 22nm Haswell. Specifically Intel is already seeing a “30 percent power improvement” on battery longevity over Haswell with their early Broadwell silicon (being demoed at the show), with at least some expectation that they’ll see further improvements as they approach release quality silicon. Meanwhile Intel has also reiterated that they will be following through on their earlier plans to accelerate Atom product releases to move from Intel’s n+1 node to their leading edge node, bringing Atom to parity with their desktop/mobile Core processors. To that end Airmont, Silvermont’s 14nm successor, is still slated for a 2014 release. 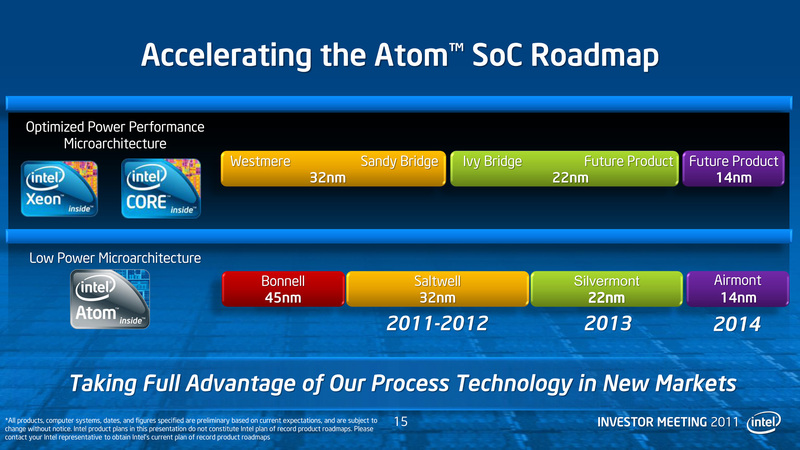 The move from trailing nodes to leading nodes for Atom SoCs is perhaps the biggest sign of how Intel is treating the tablet/smartphone market this days, with the market being elevated from a secondary market to a primary market that receives (nearly) equal access to Intel’s latest fabrication technology, and by extension being a market that requires Intel’s most competitive products. It's been 2014 for years, with 2013 being the year they'd be going into manufacturing. 10nm isn't difficult, in a relative sense. You can either use quad patterning or EUV. 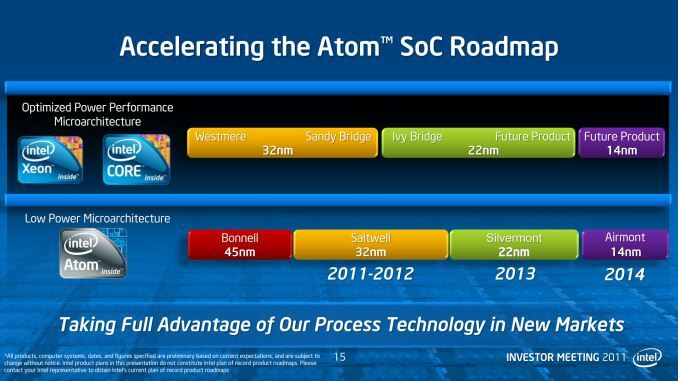 It may be difficult to make economical, but Intel's 10nm R&D is finished, IIRC. Mike Mayberry, director of component research at Intel Corp.
"Mayberry said that everything up to the 10-nm CMOS node – which is in development at Intel and will ramp production in 2015 - is effectively done. However, he said his job depends on being able to continue to double density and performance every two years beyond that, something for which the way forward is much less clear."